For all its popularity, it's surprisingly difficult to find sushi that isn't only decent but doesn't cost you an arm and a leg. If price isn't a factor, there's plenty of great sushi spots around Seoul but if you're looking for sushi that's at an excellent value, you should make a note of today's place! 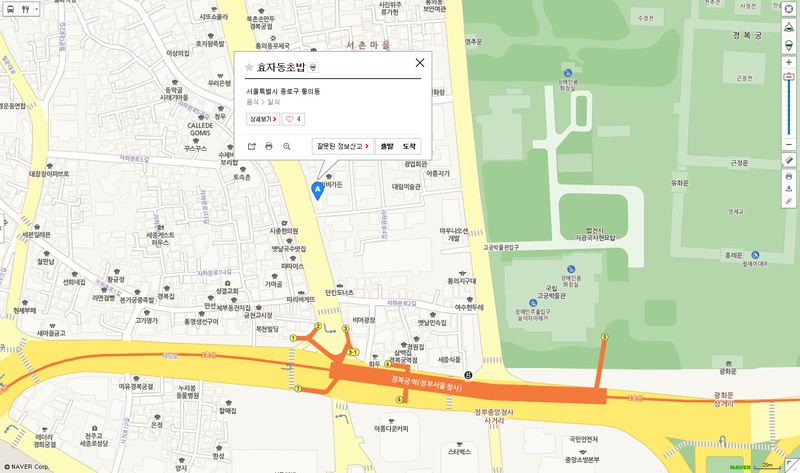 Over in Tongeui-dong, just west of Gyeongbokgung Palace and not too far off from Tongin Market, is Hyojadong Chobap and just a stone's throw away from the trending Seochon neighborhood. It's not too difficult to find as it's not only on a main road but because certainly you can expect lines at peak dining times. In fact, Hyojadong Chobap is already well known not only among locals but Seoulites for the value and quality of food here. The owner was inspired to open this shop after having visited quite a number of sushi places around the city with his family but left disappointed to find things amiss and him footing a huge bill. He's said to be notoriously particular about his sushi making to the point he doesn't even allow any of his employees to wash and prepare the rice. Instead, he washes each batch of sushi rice himself to the point he knows is ideal for absorbing the vinegar later and then cooks the rice in a specially prepared Japanese rice pot that's for making sushi rice. He also insists on fresh, larger sized fish being brought in every 2-3 days which he himself prepares. Despite the higher prices, he goes with these larger fishes for their taste. Prepped in a traditional Edo-style way (Edomae sushi), the fish undergoes a kobujime process in which the fish is left to rest after being wrapped in prepped kombo (dried kelp) for the kombu to remove the excess water while imparting and infusing flavors. Despite all the labor and effort prices are relatively low for their quality and this is what attracts the crowds and creates the lines at peak meal times. It doesn't help that the restaurant itself is on the smaller size probably able to accommodate some 25 folks or so max. For sushi offerings, a 10 piece assorted set will only take you back 10K, a special assortment of 12 pieces is 13K, the Hyojadong special of 12 pieces is 20K, 10 pieces of flatfish sushi is 13K, 10 pieces of salmon sushi is 12K. You can also order additional sushi in sets of 2 which ranges from about 2.5K to 4K. But, by far the most popular items of the entire restaurant are the two sets they carry. One is the Udon Set for 8.5K which includes a bowl of udon and 5 pieces of sushi. Understandably, this is a screaming deal which is why they actually limit it to only the first 30 customers everyday. The second set, the Hyojadong Set, is meant for two and gives you 22 pieces of sushi, 2 shrimp tempura and 2 mini bowls of udon for 25K. Does the reason for the often lines out the shop's door make more sense now? After ordering the Hyojadong set waited by munching on some of the tsukemono (pickles) including gari and rakkyozuke (though this latter is more commonly eaten with dishes like curry). Individual bowls of miso and simple salad is brought out. The mini udon is exactly as its name implies. It's udon that's just a slurp or two from completion. It wasn't overly salty or sweet as some joints are. The real star of the entire set though. Good mix of everything from tuna to octopus, shrimp to salmon. All the seafood was fresh, plump, and tender. The popularity of the place helps further ensure the seafood coming in and being served is fresh too. And let's not forget you get the 22-count sushi pieces, shrimp tempura, udon, and all the standard sushi fixings for only 25,000 won! The convenience of the location to not only Gyeongbokgung (Gyeongbok Palace), the rising neighborhood of Seochon nearby, and nifty art galleries all around and the Museum of Modern Contemporary Art (MMCA) makes it a great place for friends and dates. Just make sure you come early to beat the lines! Diverse enough to please all sushi lovers and just the perfect amount of food for two, the set here is a fantastic deal. Further praise goes for the quality, serving size, and location, though it's too bad the place is so teeny tiny that you're almost fated to have to wait in line. Walk straight out of exit three of Gyeongbokggung Station for about 200 meters and you'll see Hyojadong Sushi on your right. If you're coming by yourself, try and go for the udon set which is a bowl of udon and five sushi pieces for 8,500 won. But be warned, the udon sets are limited to only 30 servings offered per day! Try and avoid peak lunch and dinner times to avoid the worst of the lines.